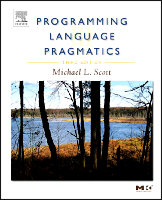 Welcome to the website for Scott, M: Programming Language Pragmatics, 3rd Edition. The latest Errata sheet is available from the author's Web site clickhere to access. All fragments that have been tested using compilers and interpreters, including chapters 15 and 16.